But when it comes to good times, the beach is just the beginning. You might try us out for our warm ocean waters, but you’ll return year after year once you discover the endless opportunities for fun with the family … by land or by sea. Gulf Shores and Orange Beach are surrounded by water, and the opportunities for swimming are endless. Here, we use a flag system to identify water conditions. When the green or yellow flags are flying, it’s safe to take the family for a fun day of body surfing or skimboarding. Your kids will jump with glee as they splash through the waves. If the red flags are out or your family prefers calmer waters, check out the activity on the Intracoastal Waterway. Lifeguards keep a careful watch at public beaches in the Gulf State Park, which are well equipped with accessible restrooms, change rooms and picnic tables. With the white sand beach in all directions, this is prime real estate for creating your dream (sand) home. Check out Souvenir City to buy buckets, shovels and other sand toys. Make sure to get a picture in the shark’s mouth while you’re there. Kids love it when they are allowed to stay up late with Mom and Dad! So gear them up with a flashlight and a small net, and head to the beach after dark to search for ghost crabs. These wee creatures, often seen scurrying along the shoreline between sunset and dawn, are super fun to catch. Don’t be fooled by their small size … they can make tracks at speeds up to 10 mph! Fort Morgan has guarded Mobile Bay since 1834 and is one of the finest examples of military architecture in North America. It was here that Union Admiral David Farragut made history when he yelled, “Damn the torpedoes! Full speed ahead!” Today, the fort hosts an annual event commemorating this famous moment, as well an active living history program presenting key aspects of daily life in the fort – complete with exciting moments like canon firings. During the summer they host weekly Civil War twilight tours, as well as daily guided tours. Click to read more about Fort Morgan. 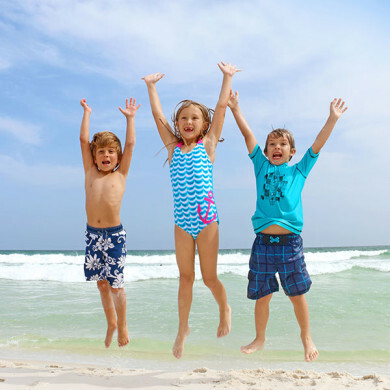 Orange Beach and Gulf Shores offer countless ways to get up and moving with your brood. From bike rentals to paddle boards and even the newest trend in fly boards, we’ve got you covered. If you want to pedal, visit our friends at Infinity Bicycles. They offer everything you need to roll through town, with rentals of adult and children’s bicycles and gear. They also host free community rides every Saturday. Stand-up paddleboarding is one of the fastest growing water sports in the world, and it is easy to learn. The flat water on the Intracoastal Waterway and local bayous is the best place to start. Small children can ride comfortably on the board while Mom or Dad paddle. While on board, check out the sea life that gathers around dock pilings, stop for lunch at a waterfront restaurant or take a guided tour on a local river. These great local tour companies offer equipment rentals, lessons, board delivery and guided excursions: Alabama Paddle Sports, Flora-Bama, Gulf Shores Paddle Board Rental and Perdido Paddle Boards. Flyboarding is new to the Gulf Coast, and you can find it right here in Orange Beach. This trendy watersport uses jet propulsion to “fly” you up into the air! Just call FlyBoard BAMA to have an adventure that will be the envy of your friends back home. Fishing is a very popular Gulf Coast pastime, and for good reason. There are more kinds of fish in our local waters than anywhere else in the world, and the options for casting a line are as bountiful as the fish you’ll catch. You can fish from the beach, from the Gulf State Park Pier, try your luck inshore or offshore in the Gulf of Mexico, or explore our rivers, lakes, bayous and bays. The Gulf Coast is home to the nation’s largest artificial reef, as well as one of the biggest charter fishing fleets in the United States, with more than 100 experienced captains offering individually catered fishing adventures. To help you ‘reel in’ the best charter for your family, we’re happy to share a few of our favorites: Adrenaline Fishing Charters, Getaway Charters and Distraction Charters, which was the first offshore guide service in the Orange Beach to specialize in family-friendly trips. If you want to go deep sea fishing, book a day with Captain Randy at Reel Surprise Charters. He specializes in walk-on trips charged per person, providing a great option for budget-conscious travelers. Witnessing dolphins jump, glide and frolic in their natural habitat is a magical and unforgettable experience. There are several top-notch tour providers offering cruises throughout the day, so you can choose the time and location that works best for your family. It’s wise to reserve ahead, but some outfits do accommodate walk-ons. Among the best tour operators: Chute for the Skye, Flora-Bama, The Sunny Lady Dolphin Tours at the Wharf or Dolphins Down Under. If you come from a family of thrill seekers, then you’ll love parasailing, snorkeling or a jet ski tour. Adventure Aquatics offers guided dolphin tours on jet skis. Chute for the Skye or Pleasure Island Parasail will take your family to unimagined heights. And the Down Under Dive Shop offers snorkeling tours that include equipment rental. The Wharf at Orange Beach is a great place for a break from the beach. For starters, you’ll find a 15-screen cinema, ferris wheel and 18 holes of miniature golf. You can also check out Sharkey’s Family Adventure Park to enjoy two high-rope courses joined by a ‘Sky Rail’ and zip line. Little ones can play in the ‘Sky Tykes’ course, a scaled down version designed for children ages 2 to 7. Looking for more? Check out the 4,000 square foot laser tag room and bazooka ball paintball game at Arena, the Next Level. Vests and full face masks make it safe and fun. Restaurants, shopping, and a spa are great additions for Mom and Dad. And, depending on the time of year, you could catch an awesome concert at the Amphitheater. If you have a sunburn and need to spend a day inland, there are many attractions that will wear your kids right out. Adventure Island features adventure mini golf, an arcade, go-karts, bumper boats and laser tag. They offer kiddie options to speed around the track, skipper their own ship or take to the skies in the amazing ‘Frog Hopper’. Waterville USA has both a water park and an amusement park with water slides, water play areas, the Gulf Coast’s fastest wooden roller coaster, mini golf, a huge game room, and the 2,500 square foot ‘House of Bounce’. The Alabama Gulf Coast Zoo is a perfect place to get cuddly with wild animals. They offer up-close encounters with tiger cubs, baby kangaroos and baby lemurs. The zoo is also home to more than 500 other creatures, including monkeys, bears, lions and reptiles … OH MY!